Not a big fan of basketball, though March Madness is always a bit of fun when local teams are involved. Big 12 is well represented though Oklahoma State is pitted against Michigan (sorry B.E. 😦 ) in the Midwest Regionals first round. I am, however, a fan of all things cheesy and dippy. 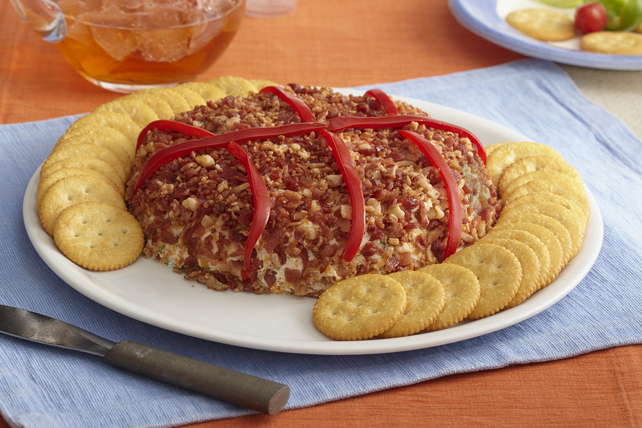 This cheese ball/spread sounds easy and yummy. Plus, Ritz crackers! Beat all ingredients except bacon bits, peppers and parsley with mixer until blended. Refrigerate several hours. Form into basketball shape on platter. Coat with bacon bits. Add pepper strips for the stitching. Serve with crackers of your choice. This entry was posted in Writing Life and tagged food, fun stuff, recipe, sports, Tuesday Treats. Bookmark the permalink. LOL, totally okay. I don’t follow basketball that much, and I’m kinda on the outs with U of M right now anyway. Yummers on all things cheesy and dippy!